Terri Libenson is the author of Invisible Emmie, a new graphic novel for kids. 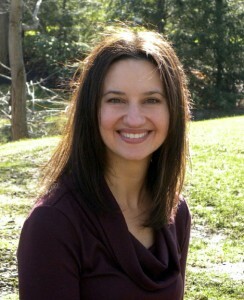 A cartoonist, she is the creator of The Pajama Diaries comic strip. She lives in Cleveland. 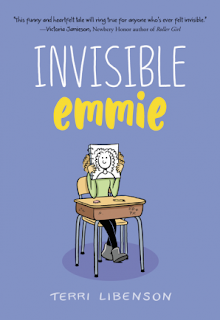 Q: How did you come up with the idea for Invisible Emmie? A: I started writing without an outline or clear idea of where the story would head. The plot came about rather organically. 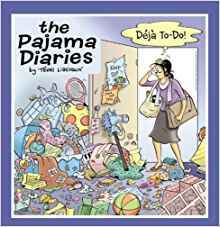 But I wanted to base the main character, Emmie, on myself at 13 because I had a very good memory of how I felt at that time – shy, yet yearning to express myself, which I did by drawing. So the book began with a day in the life of shy, artistic Emmie and grew from there. Q: Did you come up with the drawings and the text simultaneously, or did you focus on one before the other? A: It was usually simultaneous, although there were times the ideas were rushing at me so fast, it was easier to jot everything down and then go back and illustrate. I should always be so lucky to have that problem! Q: At what point did you know how the story would end? A: I just started writing about Emmie’s day. About a third of the way through, the idea hit me. It seemed so in line with Emmie’s character, I never looked back. So the ending didn’t change, only some minor plot twists along the way. 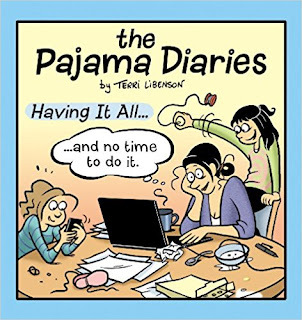 Q: Who are some of your favorite authors and favorite cartoonists? A: I don’t have a particular favorite author or cartoonist, I read so many different types of books and comics, and my tastes keep changing. Lately I’ve been on a graphic novel kick and really enjoyed a book by Guy Delisle. I’d like to read more by him. I can tell you which cartoonists inspired me the most growing up: Charles Schulz, Berke Breathed, and Lynda Barry. I just met Lynda Barry in person and unexpectedly broke out in tears. Not my classiest moment, but worth it. A: I’m working on the next book in the “Emmie” series…although it stars two different characters. I’m also continuing to write my syndicated comic strip, “The Pajama Diaries,” which I really enjoy doing. A: Sure! You can keep up with all the happenings of Emmie on my website. I try to update it pretty frequently. And please buy the book!